Going to start out positive. Slingshot makes a great product, and for now I think I prefer the Slingshot branch of the foiling family tree. Foil-academy is a good idea but pretty general. So, I go to the Hood River Slingshot HQ to get more info and pretty much get blank stares. "Talk to Dave at Windance". Well Dave's trying to run a business. "Go to the Event Site and talk to Tony a 4 PM". That's a little inconvenient. Brand new product line and very little info. $2200 for a completely new foil is not a cheap date. Demos? Questions? Props to Bruce and Dale at Sailworks for their customer support. I walk in with a sail tape issue and have 3 guys with tape measures looking at my foil gear. I walk out with a brand new North Pacific board and carbon foil. "Oh just bring it back tommorow"
They don't even publish specifications. No fuselage length, wing area, wing length, nothing except mast length. Honesty I've found their product long on hype and short on development. The poor crew in the warranty / front desk department are not windsurfers. They should have sent you to me, as the new Windsurf Brand Manager, but since I have only been working there a couple weeks they probably weren't aware they were allowed to send you to me, The new big boss of windsurfing hahaha. Slingshot with their distribution for kite, wake, surf and windsurf in 43 countries and hundreds of stores is definitely a different animal than Sailworks. But not to worry now they have a full time windsurfer on the team! The products being "Big on hype and short on development"?!?!? Tony Logoscz has been designing all the wings from the ground up himself and testing foils like a madman over four different sports with the top riders in the world. The guy is a genius and he absolutely rips at every one of the sports. 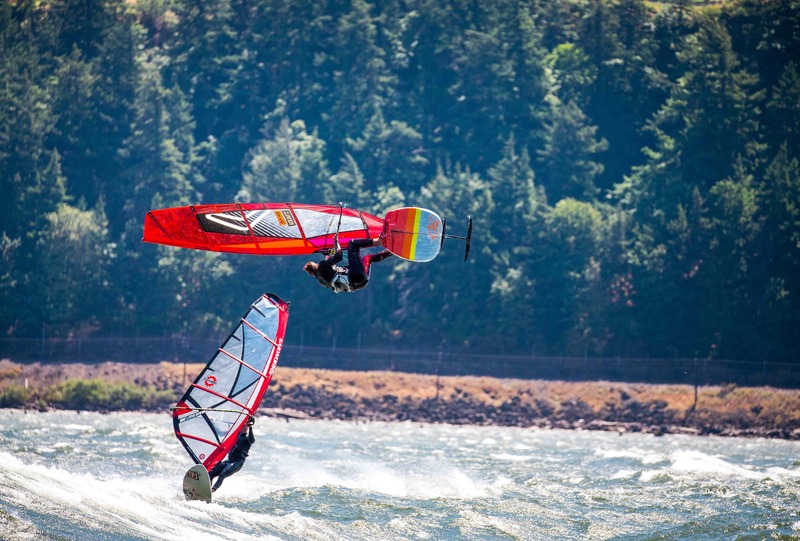 I don't actually think there is a better windfoiler in the Gorge. However, I agree there should be specs on those new Ghost Whisper setups for all the techie guys out there. We'll work on that ASAP. And I will head in this morning and tell the front desk / warranty crew to send all windsurf inquiries my way. I've snatched up all the demo stuff anyways. Wyat, it was never my intention to trash the brand and I really don’t care about the specs. Being 60 I’m way past upside down wave sailing at the Hatchery, but “good on ya”. I sail down at Stevenson on your H4 wing. I watch Tak on the ghost whisperer kite version go like a bat out of hell and jump 80 feet in the air. Not interested. Just want to go upwind and ride an occasional swell. What is the future for the bolt together 1st gen? There appears to be two new front wings available for the 1st gen. How do they fit in with the H wing line. There are two new full carbon foils. Do they work with a existing boards? Is the race version only for Tak like riders? Is the new rec foil a lifty go slow foil like the H2? And no, the picture is not customer support. Customer support would be explaining how the board, foil, and sail work together to make the picture possible. Is that board for sale on any Slingshot site? Not to my knowledge. Is the foil the Ghost Whisperer? 3.2 on a 145 Dialer is not the way to get there. Sure if that after trying to sail upper 20’s today. Yep the board in the photo is the currently available Wizard 105 with the new 2019 paint job. The foil is the Ghost Whisperer 101cm with the standard front wing. If you are rocking the 3.2 on the Dialer 145 it sound like you are ready to graduate to a smaller board for sure. The 1st gen aluminum setup will continue for a couple years. Eventually all the wings will work on both Ghost Whisperer and Aluminum Hoverglide set up. There will be a converter fuselage so your old Hoverglide wings will work with the Ghost Whisperer mast. And we will have a carbon mast upgrade for the Hoverglide. The two new wings are great. The Infinity 76 is the H11. We decided to make this the standard Hoverglide wing for 2019. I fell in love with the wing in Baja and it was all I wanted to ride. Super low stall speed makes jibing really easy. It gets up and going at 10mph and works great as a pump foil (I even like to use it to tow into waves with a surf board). For riding swell and wakes and really tuning into the power in the water it is the best wing. Tops out at abut 25mph. It is just a really playful wing, that makes getting up and jibing really achievable. The Time Code 68cm, is a faster wing that I use for jumping. It has a lot of lift for a smaller wing and a relatively low stall speed for its size. Its wingspan makes it less twitchy side to side than other small wings. All the aspect ration and surface area is up on the website in the images. These products are for 2019 and are just now being added to the website so more info and the latest videos we have been working on will be added soon. The New Carbon Ghost Whisperers work with great with all the boards. The race wing is really fast and twitchy side to side. It slices through the water like butter. Still has some good lift and relatively slow stall speed through nothing like the recreational wing (which a lot of kiters are using for racing and wave riding). Personally I am more into jiving and carve 360s and riding swell than blasting speed so I like the bigger wing for the Ghost whisperer. It is still plenty fast. A trend that I see and have experienced myself is that when folks learn to foil they immediately want a smaller wing to go faster faster and jump. Then they get onto a bigger wing and find how playful it is. Jibing is easy, pumping swell is tons of fun and the stability lets you relax. Then they ditch the smaller wing for the bigger more playful wing. Now we are finding that riding the huge pump foil wings is a blast. Foiling through upwind and downwind 360's is a blast, you can ride straight downwind forever and going 20 mph instead of 26mph is just fine. I think that unless you are going to be jumping it, the bigger wing is the way to go across the line. Hope that helps! See you guys out there! Will the H11 bolt onto existing foils? What is the wing area? A lot of people have noticed Stringy's faithful dedication to Slingshot products even when he was kiting. He deserves some rider support.